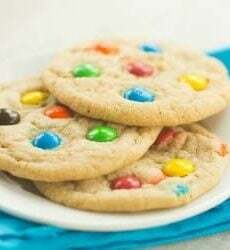 Perfectly soft and chewy cookies dotted with M&M's. Sift together the flour, salt and baking soda in a medium bowl; set aside. Beat together the melted butter and both sugars on medium speed for 2 minutes. Meanwhile, whisk together the whole egg, the egg yolk, milk and vanilla extract in a measuring cup or small bowl. Reduce the mixer speed to low and slowly add the egg mixture. Mix until thoroughly combined, about 30 seconds. Gradually add the dry ingredients, scraping down the sides of the bowl as needed. Once the flour mixture is incorporated, add ½ cup of the M&Ms and stir in by hand with a rubber spatula or wooden spoon. Refrigerate the dough for 1 hour. Preheat the oven to 375 degrees F; place oven racks in the top third and bottom third of the oven. Scoop the dough into 1½-ounce portions onto parchment-lined half sheet pans, 6 cookies per sheet. Bake 2 sheets at a time for 15 minutes, rotating the pans halfway through. Remove from the oven, slide the parchment with the cookies onto a cooling rack and press extra M&Ms onto the tops of the cookies. Allow to cool for at least 10 minutes before serving. Leftover cookies can be stored in an airtight container at room temperature.